Wixom, MI– Trijicon is going to give one of their Facebook fans a FREE 300 AAC Blackout ACOG, just in time for Christmas! To celebrate the 2014 holiday season, Trijicon’s Facebook sweepstakes will run throughout the month of December, and award an ACOG to ONE lucky Facebook fan. Registration for this giveaway can be completed through Trijicon’s Facebook page (https://www.facebook.com/trijicon) and requires no purchase or entry fee for participation. To join us in the Trijicon ACOG Christmas giveaway, simply visit the Trijicon Facebook page or click on the following link http://woobox.com/6czht7. In order to register for your chance at a free Trijicon ACOG, all you have to do is fill out the entry form to complete the submission. You will receive 2 bonus entries for each friend or family member who enters from your shared Facebook link. Be sure to ‘LIKE’ us on Facebook for information and updates on our complete array of Brilliant Aiming Solutions™ for the hunting, shooting, military and law enforcement markets. Trijicon is offering 300 AAC Blackout reticles in the 3.5×35 and 4×32 ACOG® configurations. These models feature the Blackout reticle with Trijicon’s industry-leading tritium/fiber optic technology. An LED version is also available in 4×32. The Trijicon 3.5×35 and 4×32 ACOG® 300 blackout reticle with merged aiming points has been optimized for simplicity and efficiency. It allows the user to instantly switch between supersonic and subsonic ammunition without having to re-zero the optic. The supersonic BDC (out to 600 yards) is merged with the subsonic BDC (out to 200 yards) to provide one set of aiming points for both types of ammunition fired from a 16” barrel. This BDC is not limited to one or two specific bullets. Once properly zeroed, a majority of commonly available ammunition will fall within the 2 MOA diamond aiming points. Perryton, TX– Many firearms companies claim that their products are 100% American made; with Republic Forge, this claim is authentic. Republic Forge, a true American firearms company, is setting new industry standards with their flagship 1911, the Republic. The Republic features a match-grade 5” barrel, 25 LPI checkering on the front strap, a wide array of custom cerakote options and color coordinated VZ or various Ivory grip options. Offered in .45 ACP, 10mm, .40 S&W, .38 Super, and 9mm calibers, the Republic has a retail price starting at $2,795. Born and bred in Texas, this firearm was made for the American people. The Republic is a 1911 that is resilient, authentic, and patriotic; one that you can build all on your own. Now, for the first time in the custom 1911 market, consumers can navigate to Republic Forge’s website and build their very own Republic Forge Pistol. With easy navigation and an unprecedented number of customizable options, the “Build Your Own” application will transform the way you buy your next firearm. 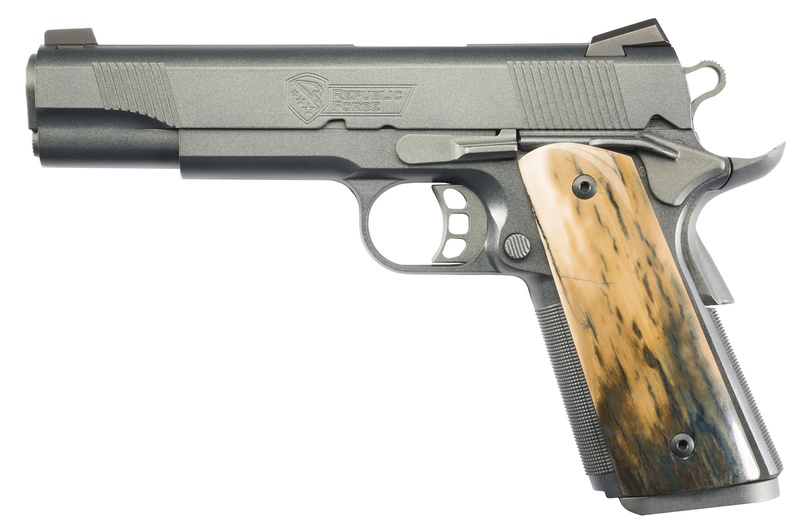 No matter the application, Republic Forge offers a 1911 that even the most discriminating shooter will be proud to own. If you are in the market for building your very own, American-made, 1911 that blends old world craftsmanship with cutting-edge technology, the Republic model might be the next pistol for you. For detailed information on the Republic and to begin customizing your very own Republic Forge, please visit www.RepublicForge.com or contact Eddie Stevenson at eddie@driftwoodmediacom.com.